I believe I have said a thing or two about British humour and here I go again – YEAH! I LOVE British humour. It beats every other country’s, including my own. From 1990-1993 I had the great pleasure of watching Stephen Fry and Hugh Laurie play the delightful characters of Jeeves and Wooster. Jeeves and Wooster are characters that were devised in the brilliant mind of P.G. Wodehouse and thankfully the television series retains the goofyness of Wooster and the dry, sarcastic and brilliant ways of his valet Jeeves. 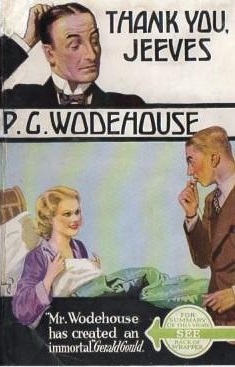 It was love at first sight and set me wondering if this Wodehouse was worth checking out. YES. The insanity of the characters of the British upper-class is carried through all of Wodehouse’s stories about this eccentric duo. For once, I will recommend that you both watch the series and read the books (audio or otherwise). P.G. 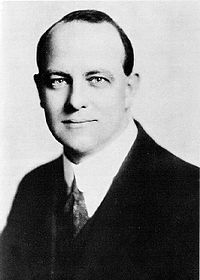 Wodehouse was an English humourist who wrote plays, novels, short stories, poems, song lyrics and journalistic articles. 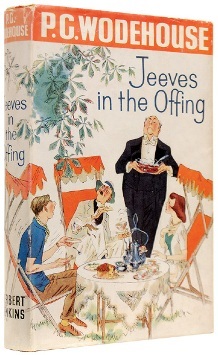 His Jeeves and Blandings Castle short stories and novels began in 1915 (Extricating Young Gussie). Wodehouse continued writing about the quirky characters in this world until 1974 (Aunts Aren’t Gentlemen), the premier character being Jeeves. Jeeves, wonderful Jeeves. Jeeves is the valet of Bertram Wilberforce Wooster (“Bertie” to friends). This means that Jeeves is the personal servant of Wooster. However, Wooster does at times lend him out to friends as a butler. Which is why there are more stories with Jeeves than there are with Wooster. Basically, the plot of each story is that either Bertie, or one of his friends, gets into trouble. After they have thoroughly enmeshed themselves, Jeeves rescues them from themselves. 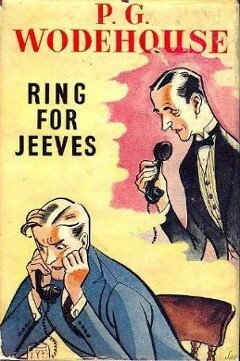 They come to Jeeves (or ask Bertie to ask him) for advice on some problem or other. I hope you will enjoy this zany duo as much as I have. Get the television series, get the novels and get the audio-books. They are all hilarious. I haven’t seen the films listed below, so you will have to get a review of them elsewhere. As with Sherlock and Christie’s characters, Wodehouse’s have been depicted a great many times (see below). The Man with Two Left Feet (1917) – a collection of short stories of which one of them is about Bertie and Jeeves. “Extricating Young Gussie”: For the first time we get to meet the dynamic duo and Bertie’s Aunt Agatha. My Man Jeeves (1919): A collection of short stories by Wodehouse. Four of these stories were about Jeeves and Wooster. One of the others – Helping Freddie – was rewritten for the US market in a collection of short stories called Carry On, Jeeves. Its name was changed to Fixing it for Freddie and Jeeves and Wooster made an appearance. Scoring Off Jeeves (Bertie Gets Even): Aunt Agatha’s goal for Bertie is that he marry. She feels he is a wastrel. The chosen girl is Honoria Glossop. Honoria Glossop is the daughter of the renowned nerve specialist Sir Roderick Glossop and his wife Lady Glossop. Sir Roderick Comes to Lunch: Aunt Agatha is still trying to marry off Bertie to Honoria. In fact Bertie seems to have become engaged to her. But when Sir Roderick comes to check out his daughter’s fiancee he finds himself wondering if Bertie is completely loony. The Great Sermon Handicap: Bertie’s cousin Eustace offers to let Bertie in on a money-making scheme that he and Claude have come up with. Bingo is already at Twing. Bertie and Jeeves decide to og down to Twing and find out what this money-making scheme is all about. The Metropolitan Touch: Bingo has once again fallen in love, but she does not seem the least bit interested in him. He asks that Bertie and Jeeves come help him win the heart of the love of his life. Jeeves Takes Charge: Uncle Willoughby guest-stars in this story. The one constant in Bertie’s life is Aunt Agatha’s attempt to marry him off to a suitable young woman. Once again she is at it and Jeeves has to step in and save Bertie. Without the Option: Bertie comes into trouble with the law due to a misadventures involving a policeman’s helmet. He then has the great misfortune to meet a girl with intentions toward him. Jeeves will have to come to the rescue once again. Fixing It for Freddie: In its original version Fixing It for Freddie was called Helping Freddie. Helping Freddie did not contain Bertie and Jeeves, but in Fixing It for Freddie they appear. Bertie attempts to reunite his friend Freddie With ex-fiancee Elizabeth. Inevitably things go wrong. 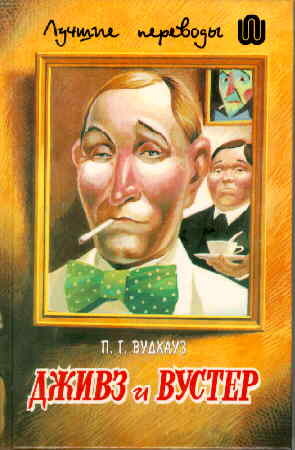 Bertie Changes His Mind: Bertie Changes His Mind is the only story that is narrated by Jeeves. In it Bertie decides he wants children and in order to do so he has to marry. Jeeves is very much against such an arrangement and we get so see just how much control Jeeves has over Bertie. The Inferiority Complex of Old Sippy: As usual one of Bertie’s friends need the help of Bertie (well really Jeeves). Sipperly is in love with the poetess Gwendolen Moon. Add to that, his ex-headmaster, Waterbury, insistings that Sipperley insert his writings into the magazine. But Sipperly’s inferiority complex keeps him from both tasks. Jeeves and Wooster are as usual at odds about Bertie’s acquisitions. Jeeves and the Song of Songs: Tuppy greatest desire is to become betrothed to Cora Bellinger. Sadly, he has abandoned Aunt Dahlia’s daughter Angela and Aunt Dahlia is not pleased. Jeeves is called in to help. Episode of the Dog McIntosh (Jeeves and the Dog McIntosh): Aunt Agatha has an Aberdeen called McIntosh. For some reason she has left Bertie in charge of him. Bertie discovers that one of his guests, Roberta Wickham, has given McIntosh to the stage producer Blumenfield’s son and is desperate to get McIntosh back. Once again Jeeves comes to the rescue. The Spot of Art (Jeeves and the Spot of Art): While in the US, Bertie and Jeeves meet Tuppy Glossop who is again up to his shenanigans. Meanwhile, Bertie is currently engaged to Gwladys Pendlebury, who like all his girlfriends, brings trouble into Bertie’s life. Add in Bertie’s troublesome cousins shipped to him by Aunt Agatha and Jeeves has his hands full. Jeeves and the Kid Clementina: Bobby Wickham gets Bertie take her and her kid cousin, Clementina, to dinner, and also to get him to drive Clementina back to school, where he is caught by a policeman while sitting in a tree on the school property. The Love That Purifies (Jeeves and the Love That Purifies): Aunt Dahlia’s chef Anatole is the envy of her friends and aquaintances. She has entered into a wager that places her in danger of losing the lovely Anatole for a while. Obviously she does not want this to happen and asks Bertie (or more specifically Jeeves) for help. Jeeves and the Old School Chum: Bingo Little has finally settled into married bliss in an inherited estate by Norwich. Mrs. Bingo’s friend, Laura Pyke, visits the newlyweds and it appears as if she and Bingo do not become fast friends. Bertie brings Jeeves along to visit the couple. The Indian Summer of an Uncle: Aunt Agatha is a very class-conscious woman and when Uncle George falls in love with a mere waitress she sends Bertie and Jeeves to solve this case of what she considers a grasping woman. The Ordeal of Young Tuppy (Tuppy Changes His Mind): Tuppy Glossop seems to fall in love all the time and Bertie and Jeeves have to come ablazing to save him from himself. This time he has chosen a dog enthousiast. As you might have guessed by now, Jeeves pretty much runs Bertie’s life. Every once in a while Bertie rebels and this time it takes the form of playing the banjolele. Jeeves is, to put it mildly, displeased with his boss and leaves his service for that of one of Bertie’s friends. Jeeves’ replacement Brinkley is not at all up to Jeeves’ high standards and he and Bertie come to heads several times throughout the story. When Bertie comes into contact with Jeeves again through his friend Chummy things are off and running. We are back at Brinkley Court the home of Aunt Dahlia (Bertie’s favorite aunt). Once again we are entangled in confusing relationships and expectations from relatives. Bertie decides that he is much better qualified to give advice to his friends and forbids Jeeves to interfere. But we all know that Bertie is probably the least qualified person on this planed to give advice on relationships and he begs Jeeves to swoop in and save the day once more. Aunt Dahlia sends Bertie off on a mission again. In order to get Cornelia Forthergill to write a piece for Dahlia’s magazine Mylady’s Budoir he is going to have to get rid of Cornelia’s father-in-law’s painting Venus. What could possibly go wrong? 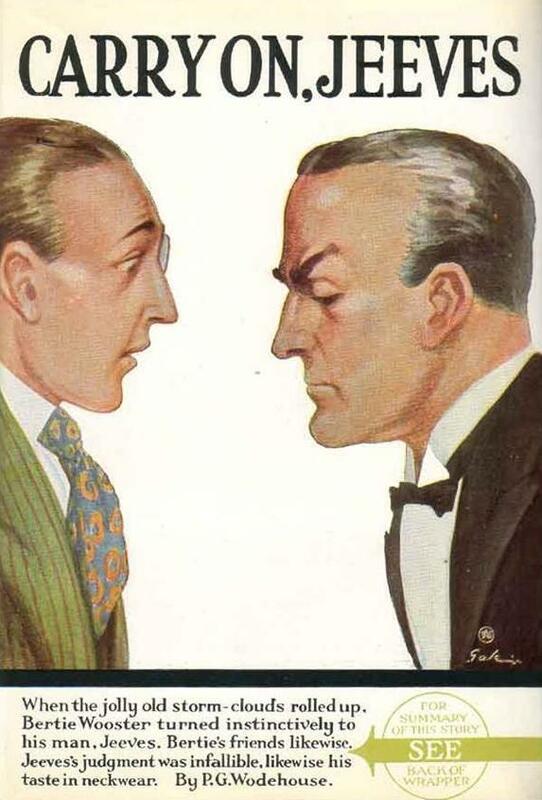 Previously Bertie and Sir Roderick Glossop have not seen eye to eye but Jeeves in the Offing sees a change in their relationship. The two of them have met when Bertie seeks solace at his Aunt Dahlia’s due to Jeeves going on holiday. Plenty of trouble lands at Brinkley Court at the same time as Bertie and Bertie is going to have a struggle to fit all the pieces together. Once again matrimonial bliss is threatened while Bertie stays at Totleigh Towers. He is not at fault. Instead Medeline Fink-Nottle puts Gussie on a vegetarian diet. Various other plots need to be solved by Jeeves, such as winning a fiance, artwork and culinary attractions. Jeeves and the Greasy Bird: As usual one of Bertie’s friends is having a problem with his love-life. Honoria has to get married before Sir Roderick’s fiance will marry him. Aunt Dahlia and the duo get involved in getting Honoria and Blair Eggleston (young Author who writes for aunt Dahlia’s magasine) together. Aunts Aren’t Gentlemen (1974) (US title: The Cat-nappers) – Wodehouse’s last Jeeves and Wooster novel completed by him before his death in 1975. Bertie has discovered a mysterious rash and is advised by his doctor to retire to the country to recover. Once in Maiden Eggesford with Jeeves and his aunt Dahlia chaos and confusion ensues, this time involving horses and cats. Most of these stories are available for free on the net. Thank You, Jeeves! (1936) — Arthur Treacher as Jeeves, and David Niven as Bertie, meet a girl and help her brother stop two spies trying to get his secret plans. The film has almost nothing to do with the book of that title. Although Treacher looks the part, the script calls on him to play the character as unhelpful and rather unpleasant, with none of the trademark brilliance of the literary Jeeves. Step Lively, Jeeves! (1937) — two swindlers con Arthur Treacher as Jeeves, claiming he has a fortune waiting for him in America, where Jeeves meets some gangsters. 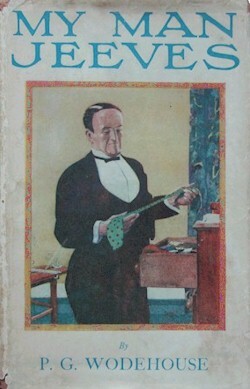 Bertie does not appear, Jeeves is portrayed as a naive bumbler, and the film has nothing to do with any Wodehouse story. By Jeeves (2001) — A recorded performance of the musical, released as a video (with UK Martin Jarvis as Jeeves and US John Scherer as Bertie). It also aired on television. Come On, Jeeves (opened 1954, still presented from time to time as of 2008 under its name or as Ring for Jeeves)—A 1952 play by Guy Bolton and Wodehouse (adapted into the 1953 novel Ring for Jeeves), opened 1954 in Worthing, England (cast unknown), published in 1956. The World of Wooster (30 May 1965 to 17 November 1967, 20 episodes of 30 minutes)—A half-hour comedy series for BBC1 (with Dennis Price as Jeeves, and Ian Carmichael as Bertie, plus Derek Nimmo playing Bingo Little). Jeeves and Wooster (22 April 1990 to 20 June 1993, 23 episodes of 55 minutes)—A hit ITV series starring double-act Fry and Laurie (with Stephen Fry as Jeeves, and Hugh Laurie as Bertie). By Jeeves (1 May 1996 to 12 February 1997; 28 October 2001 to 30 December 2001, 73 performances)—A more successful complete rewrite of the earlier version, opened in London (with Malcolm Sinclair as Jeeves, and Steven Pacey as Bertie), and premiered in the U.S. in November 1996 (with Richard Kline as Jeeves, and John Scherer as Bertie). It was produced again in 2001 on Broadway (with Martin Jarvis as Jeeves, and Scherer as Bertie), with one recorded performance released as a video film and aired on TV. What Ho, Jeeves! 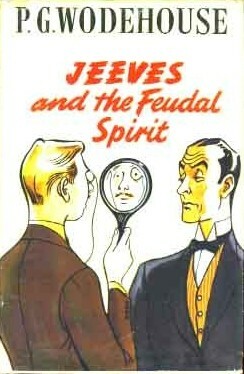 (1972 to 1981)—A popular BBC Radio 4 series adapting various Jeeves stories (with Michael Hordern as Jeeves, and Richard Briers as Bertie). The Code of the Woosters (2006)—A BBC Radio 4 dramatisation of The Code of the Woosters (with Andrew Sachs as Jeeves, and Marcus Brigstocke as Bertie). 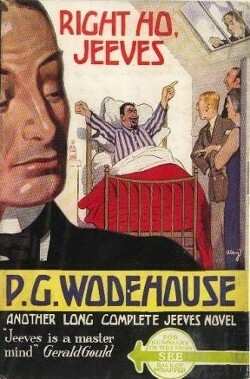 In Alan Moore’s comic The League of Extraordinary Gentlemen: Black Dossier, Jeeves and Bertie appear in the segment “What Ho, Gods of the Abyss?” in which elements of Wodehouse are mixed with H.P. Lovecraft. Bertie recounts the story of the arrival of Mi-Go to Brinkley court and the possession of Aunt Dahlia by Cthulhu. Jeeves once again saves the day and drives off the Lovecraftian menaces. The plaque, for P G Wodehouse, is fixed to a house on the north west side of Walton Street opposite St Saviour’s church.